Gray Hairstreak butterfly (Strymon melinus): perched on Ashyleaf buckwheat. Among the first butterflies noticed by many gardeners are the big, showy species like the Monarchs, Gulf Fritillaries and Swallowtails. But equally interesting – and important to the garden ecosystem – are the smaller butterflies. 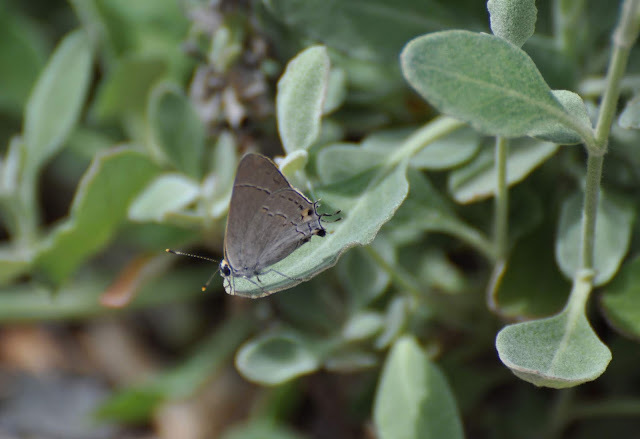 One of our favorites is the Gray Hairstreak - Strymon melinus. The Gray Hairstreak is a common species in most parts of the continental U.S. and south to Venezuela. It’s the most common Hairstreak seen in many gardens; you may have noticed it in your own garden, particularly if you grow flowering plants. Strymon melinus is one of our smaller butterflies, with a wingspan of 7/8 - 1 3/8 inches (2.2 - 3.5 cm). 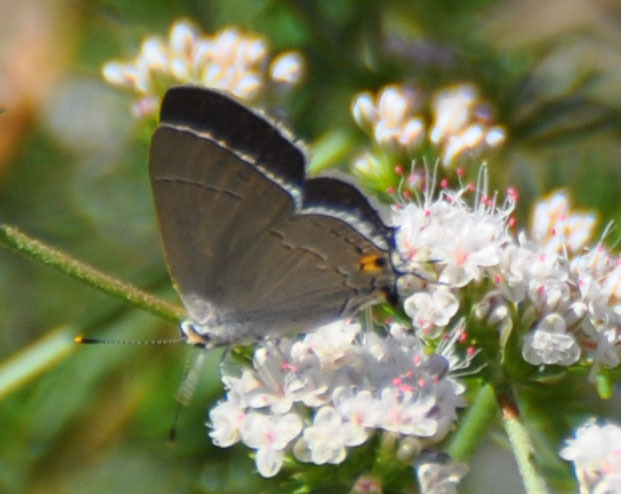 Like the Swallowtails, the Gray Hairstreak has a single ‘tail’ on the hindwing. When perched or feeding, a Hairstreak’s wings are usually closed, making the underside of the wing more commonly visible. The underside is mostly gray, with spring and fall flying adults a darker gray than those of summer. On close observation, the wings have a thin, pale fringe and thin rather straight black and white band near the edges of both the fore (front) and dorsal wings. More conspicuous is a darker, more irregular band of blotches that are white, black and orange (see below). 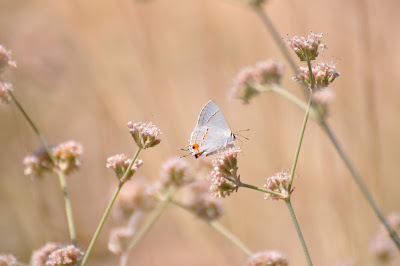 Gray Hairstreaks also have two large orange and black splotches on the hindwing. The Gray Hairstreaks we’ve seen have dark eyes and light-and-dark banded antennae with an orange tip. The heads often have a patch of orange on the back of the head. The abdomen of females may have a red or orange tinge. The upper-side is blue-gray with a large orange-red spot near the ‘tail’. For more good photographs see refs. 1-5, below. The larvae (caterpillars) have the typical form of Hairstreak larvae. They are rather flattened, with distinct segments and a slightly tapering abdomen. Color can range from almost gray through tan, green and even rosy pink or purple. Earlier chrysalids hatch 7-10 days after pupating (forming a cocoon); fall ones hibernate over winter. Unfortunately, we don’t have any photos of the larvae or chrysalids. For excellent photographs – plus advice on raising Strymon melinus – see reference 6. In our gardens, we most often see males perched on upright stems or leaves - or individuals feeding on a wide range of flowers. Perched individuals often rub their wings together – a behavior commonly seen in Blues, Coppers and Hairstreak butterflies. The reason for this behavior is unknown; it may be a defensive mechanism, drawing attention to the abdomen rather than the head. But whatever the purpose, it’s an interesting behavior to observe. Ashyleaf buckwheat. Note long, thin proboscis. 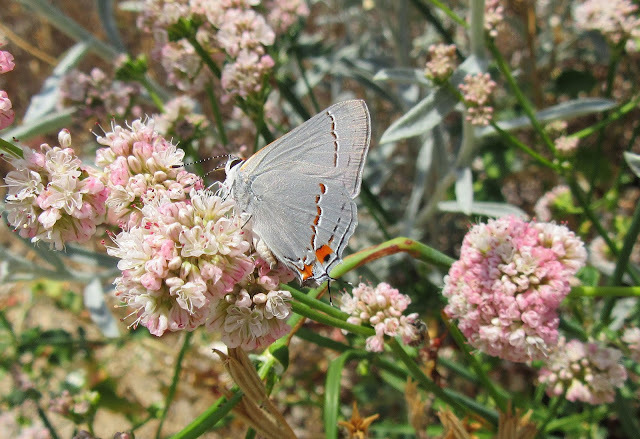 Gray Hairstreaks inhabit a wide range of sites, in large part due to their relatively unspecific food requirements. Adults obtain nectar from many plant species. 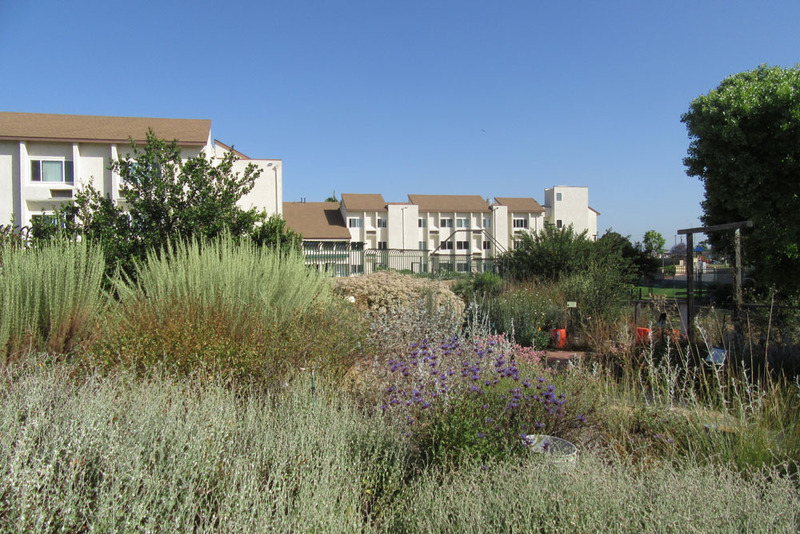 In our gardens, the most popular seem to be the native Buckwheats (Eriogonum species), the Mints (including Salvias), the many-flowered Sunflowers (Goldenrods, Goldenbushes and Telegraph plant), Milkweeds and clovers. We’ve also seen them on Globe Gilia (below) and they are known to frequent other native and non-native garden flowers. on Globe gilia (Gilia capitata), Mother nature's Backyard. The larvae are also less selective in their food requirements than many native butterflies. The host plants are mostly herbaceous annuals and perennials, commonly in the Pea or Mallow families. Recorded local host species include garden beans (Phaseolus), native Lotus species, clovers (Trifolium species), Amorpha (false indigo), mallows (including hibiscus), Humulus (hops), Polygonum species, Eriogonum (Buckwheats), Salvia (Sage) species and cotton. There likely are other host plants, yet to be discovered. Grow any of these to provide an incentive for Gray Hairstreaks to live in your garden. 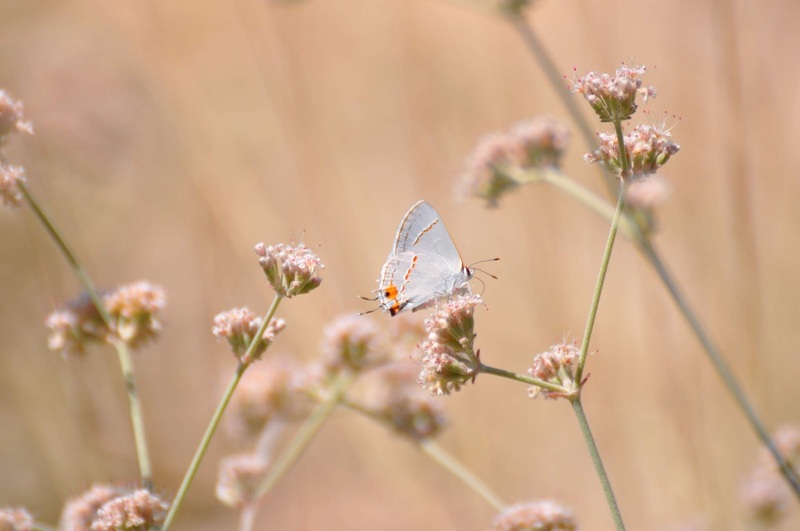 So what role do Gray Hairstreaks play in the open woodlands, prairies, parks and gardens in which they reside? First, they act as minor pollinators for the flowering plants they visit. They are not the most important – that role goes to bees and pollinator flies. But they do their part by increasing the diversity of pollinator species, helping to insure the livelihoods of insect pollinated plants. In addition, the larvae of all butterflies and moths are an important source of protein for birds and even some insects. 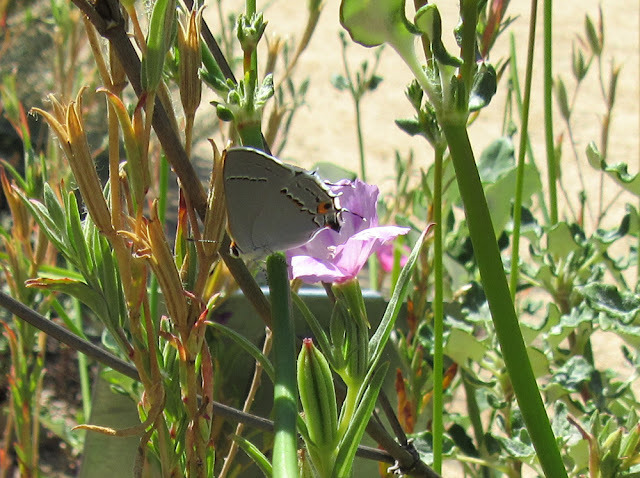 Gray Hairstreaks also contribute to the beauty and interest of local gardens. They are fun to watch and observation can be done close to home. You may want to record your observations – and send your photos to iNaturalist (https://www.inaturalist.org/). You may even discover a new host plant for Strymon melinus – right in your own backyard! Most of our native Salvias are spring bloomers. Excluding a few blossoms on the Purple sage (Salvia leucophylla), most are done for the year – at least in our water-wise gardens. 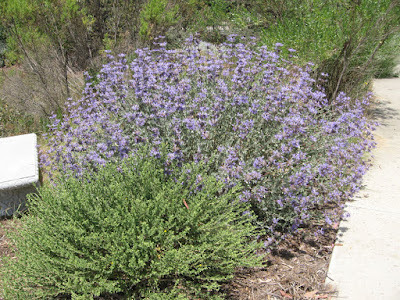 The exception is our Plant of the Month - the Cleveland sage, Salvia clevelandii. This species adds a welcome touch of blue-purple among the summer pink buckwheats dominating our summer gardens. Its scientific name is pronounced SAL-vee-uh cleve-LAND-ee-eye. Like all Salvias, Salvia clevelandii belongs to the Mint family, known for square stems and aromatic foliage. In fact, another common name for Salvia clevelandii is ‘Fragrant Sage’. 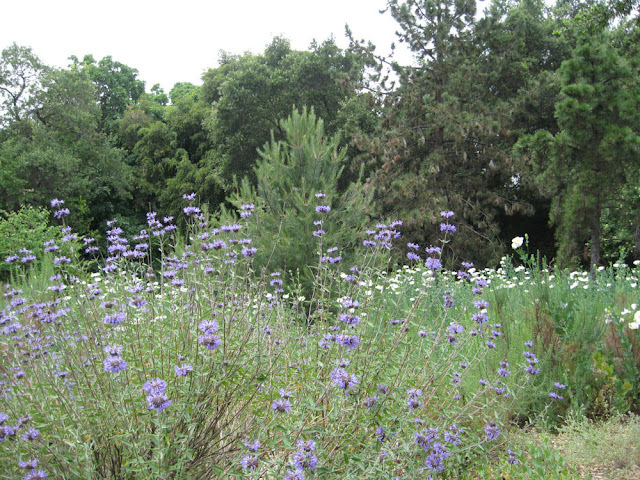 Seventeen Salvia species are native to California. Many are common, while a few are quite rare. 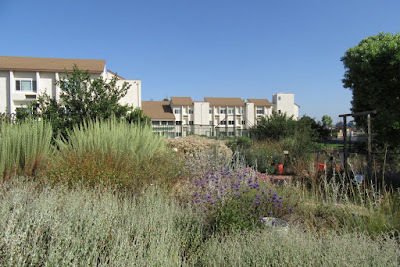 We grow seven of the common S. California species (Salvia apiana; S. clevelandii; S. dorii; S. leucophylla; S. mellifera; S. munzii; S. spathacea) in Mother Nature’s Backyard and Garden of Health. They are key species in our gardens, providing color, scent, habitat and a source of cuttings for seasonings and potpourri. 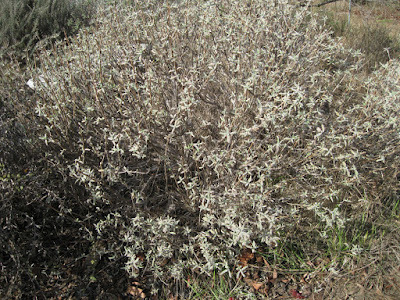 Cleveland sage is named for Daniel Cleveland, an early collector of the species. Cleveland (1838-1929), was an authority on ferns, a lawyer and botanical collector in the San Diego area. 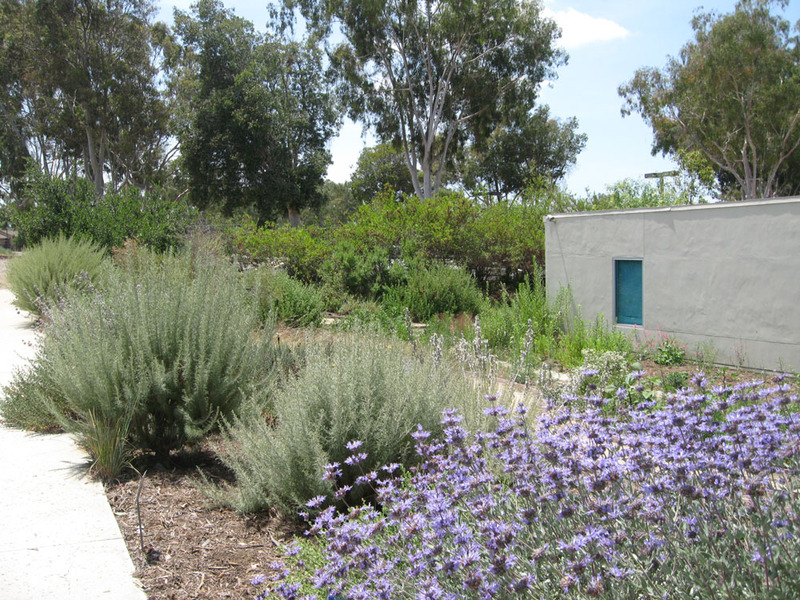 He was one of the founding members of the San Diego Natural History Society and started the herbarium of the San Diego Natural History Museum. A number of native plants are named in his honor. Cleveland sage was also collected in the 1800’s by the Parish brothers and Leroy Abrams. For more stories on early S. California plant collectors see: http://mother-natures-backyard.blogspot.com/2018/05/californias-fascinating-native-plants.html. 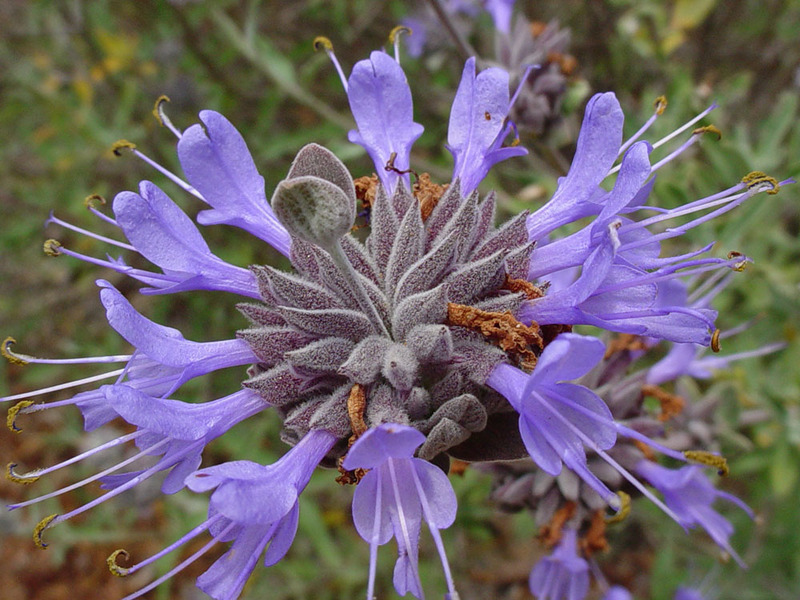 Cleveland sage grows in the chaparral and coastal sage scrub, primarily in Riverside and San Diego counties, south into Baja California, Mexico. It grows on dry slopes and common plant associates include the Canyon silktassel (Garrya veatchii), Coyote bush (Baccharis pilularis), Chamise (Adenostoma fasciculatum), Laurel sumac (Malosma laurina), California encelia and Chaparral mallow (Malacothamnus fasciculatus). Salvia clevelandii is a part-woody sub-shrub, growing 2-5+ ft. (0.5-1.5 m.) tall and about as wide. Its form may be rounded or sprawling; we suspect the form is influenced by the amount of pruning, as well as light. Cleveland sage is the most evergreen of our local Salvias; while most have switched to their small, dry summer leaves, Cleveland sage remains pleasantly evergreen through most of the summer. The leaves are small (to about 1.25 inches; 3 cm. ), pronouncedly veined and wrinkled. The aroma of the leaves is heavenly; the sweetly fresh scent is prized by many gardeners. The new stems are often tinged with red or purple. The entire plant is more delicate appearing than most of our other local Salvias. The refined appearance is another reason this species is widely used in gardens. Cleveland sage blooms for about a month, in late spring/early summer. 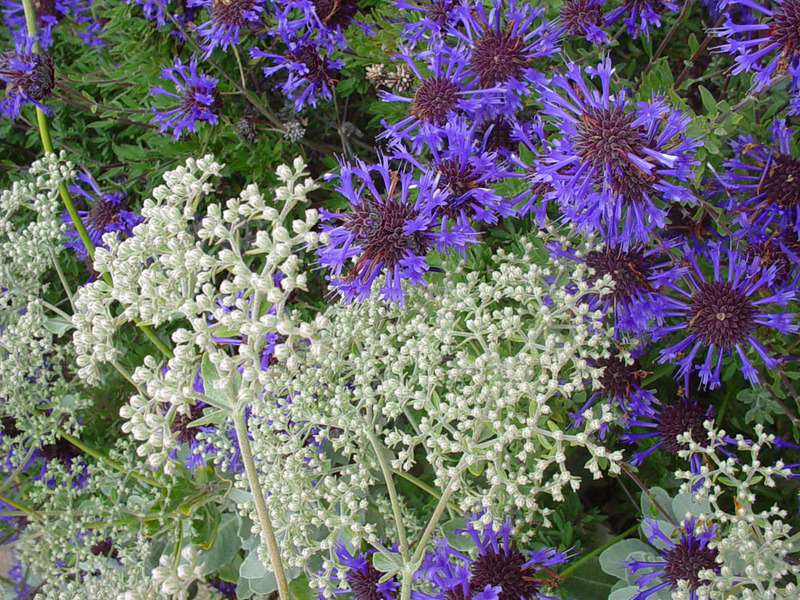 In our gardens it can start as early as April, but more commonly blooms from June into July. The flowers of this species are a more vivid blue-purple than any of the other Salvias we grow. They’re an ‘electric blue’ – photographs don’t do the flower color justice! The tiny, mint-shaped flowers grow in ball-like clusters around the stems. The individual flowers extend from the darker colored bracts, producing a particularly attractive appearance. A mature plant will be covered in floral clusters. The flowers attract hummingbirds (they may fight over the flowers), butterflies and other pollinators. Seed-eating birds like the Goldfinches pluck seeds from the stems in late summer and fall. And the shrubby habit makes great shelter for ground-dwelling birds and lizards. 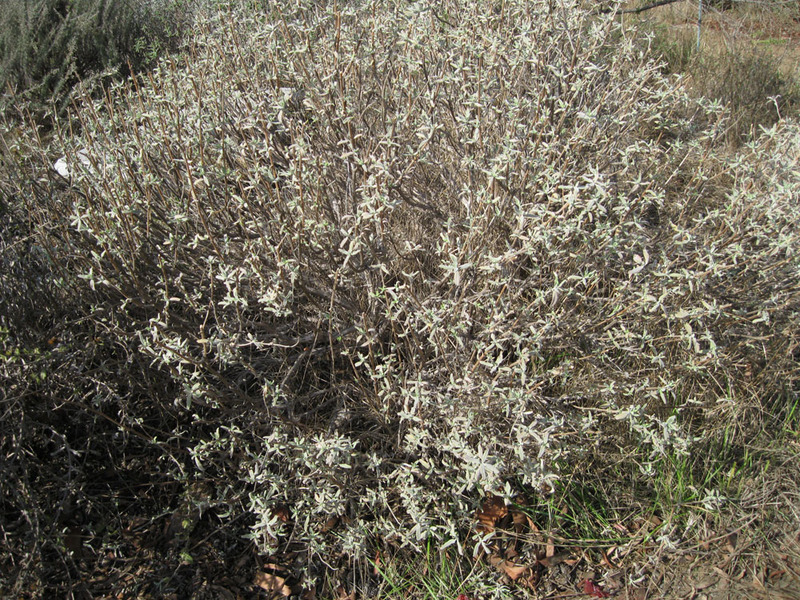 So Cleveland sage makes a good all-round habitat shrub. 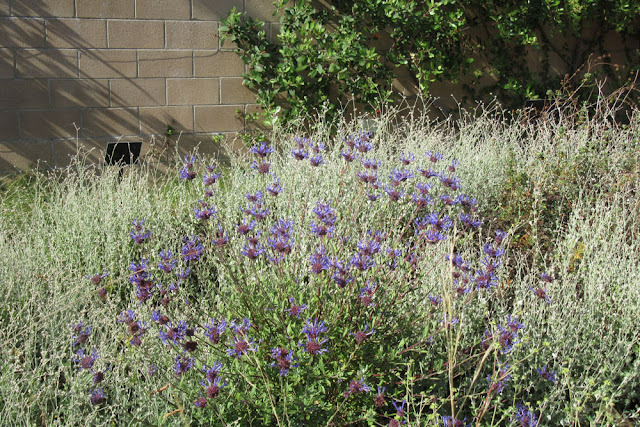 Cleveland sage prefers a light to medium, well-drained soil with pH from 6.0 to 8.5. It’s doing fine in clay-loams and clays in Gardena and Carson gardens. It does best in either full sun or with some afternoon shade (hot, inland gardens – even Phoenix, AZ). In all gardens, Cleveland sage is fine with a moderate layer of organic mulch. 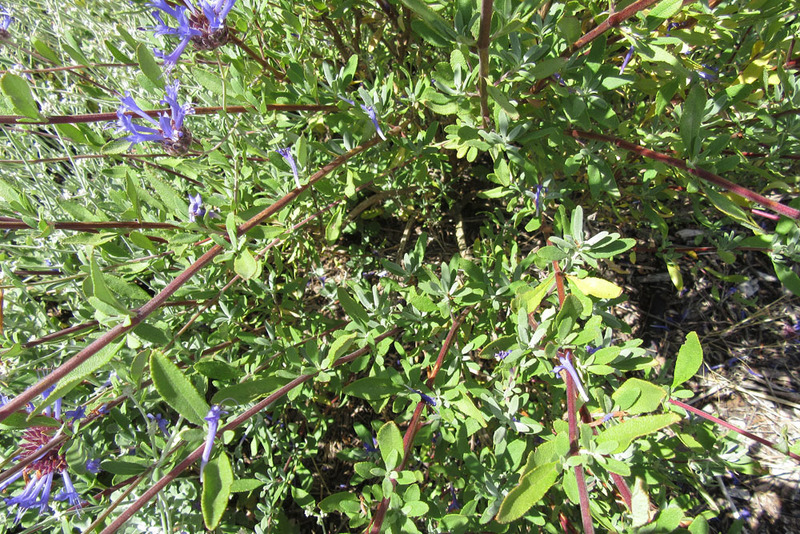 Like most native Salvias, Cleveland sage looks best with regular late fall pruning. Pruning should begin the first fall, even though the plant will be small. Each branch should be pruned back, leaving 3-4 branching nodes. Don’t cut back into the older, non-budding wood, which cannot re-sprout. Fall pruning – similar to browsing of deer in the wilds – promotes a dense, rounded shape. Deadheading the flowers, if desired, may promote a second round of blooming. Cleveland sage is widely planted in Southwestern gardens, often alongside other Salvias. So it’s not surprising that a number of attractive hybrids and other cultivars have resulted. Some of these appear to be all (or mostly) true Salvia clevelandii types, though they may be found to have other salvia genes. The most common and popular in our area is S. clevelandii ‘Winnifred Gilman’, a nicely shaped cultivar with loads of intensely blue flowers. The other ‘true’ Cleveland sage cultivar is S. clevelandii ‘Betsy Clebsch’ (recommended for desert gardeners). There are several good hybrid cultivars that share the good features of Salvia clevelandii. The most common are the Salvia clevelandii x S. leucophylla hybrids, including ‘Allen Chickering’, ‘Ponzo Blue’ and ‘Whirly Blue’. These cultivars have slightly lighter purple flowers, with more flower clusters per stalk (see above). 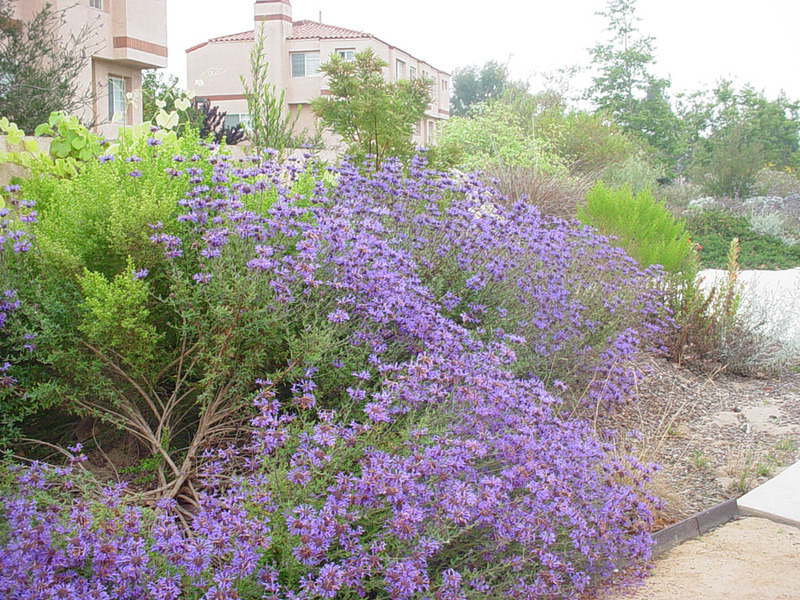 Like Purple sage, they are very drought tolerant and may be longer lived than straight Cleveland Sage. Whether you choose the straight species or a cultivar, Cleveland sage is a delight for the garden designer. Because the growth habit, foliage and flower color, bloom season, size and fragrance are quite different among the cultivars, we recommend seeing a plant in person before purchasing. 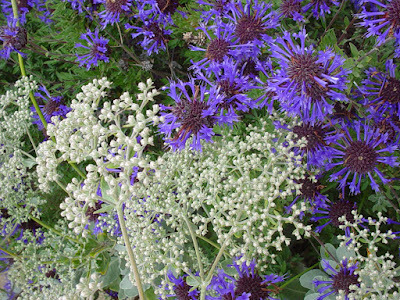 Whichever you choose, Cleveland sage adds a splash of blue-purple to the late spring and early summer garden. It contrasts beautifully with the creamy pastels of the native buckwheat flowers or the yellows of the summer sunflowers. It is also dramatic when massed. In the San Diego area it can be used to naturalize large gardens. 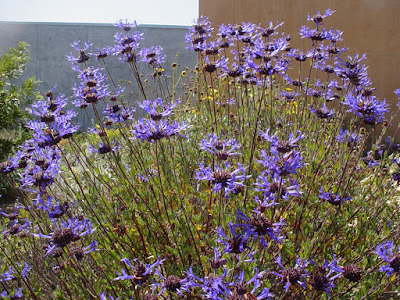 It can be used as a foundation plant, at the back of water-wise flower beds or as an accent plant. 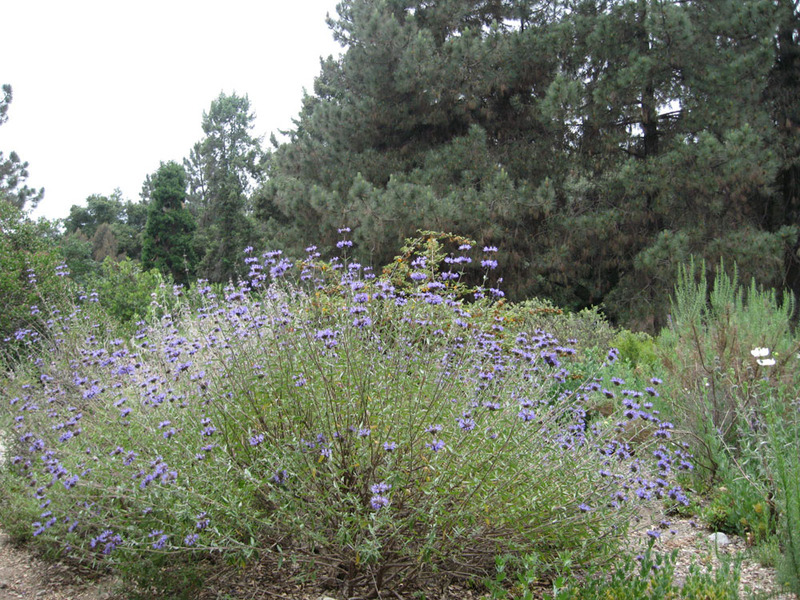 While short-lived in some gardens, Cleveland sage is worth replanting every 5 years or so, if necessary. An aroma garden would not be complete without Cleveland Sage; it smells like no other sage and is delightful beside a seating area in summer. The flowers – even the dried stems – make great cut flowers. The leaves can also be dried for use as a flavoring, incense or potpourri. The scent lasts for at least 6-8 months after drying. Place a sachet of dried Cleveland sage in a clothing drawer for a reminder of summer. Or use the dried leaves to create a refreshing bath or shower. In summary, Cleveland sage is beloved by gardeners for its graceful shape, bright flowers and wonderful aroma. It is a native habitat plant, with many practical uses. So search out Salvia clevelandii (or its cultivars) next time you visit a native plant garden or nursery. You may be convinced to find a place for it in your own garden.